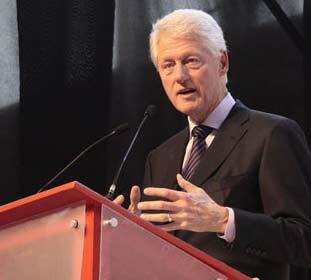 President Bill Clinton inspires leadership commitment among students during visits to Laureate International Universities member institutions in Mexico and Honduras. Laureate's Honorary Chancellor delivers visionary speeches to students at Universidad Tecnológica Centroamericana (UNITEC) and Universidad del Valle de México (UVM) about education and interdependence in the 21st Century. Thousands of university students in Mexico and Honduras turned out to greet President Bill Clinton during his visit of Mexican and Central American institutions in the Laureate International Universities network this week. President Clinton delivered his inspiring message during visits to the Universidad Tecnologica Centroamericana (UNITEC) in Tegucigalpa, Honduras and the Universidad del Valle de Mexico (UVM) in Mexico City, Mexico, two of the leading institutions in Laureate’s global network. The centerpiece of the President’s visit to both universities was a keynote address on the vital role that Laureate students can play in engaging with an interdependent world. As Honorary Chancellor, President Clinton advises Laureate on social responsibility, youth leadership and increasing access to higher education. He has spoken on the topics of youth leadership and civic engagement to students and faculty at many institutions in the Laureate network, visiting institutions in Germany, Spain, Turkey, Malaysia, Brazil, Peru, and the United States. This was President Clinton’s second visit to UVM and his first visit to UNITEC Honduras. During his administration, President Clinton, the 42nd president of the United States (1993- 2001), made the largest investment in education in more than 30 years. His commitment to improving the quality of education in the United States helped to expand access to early education and made higher education more affordable and accessible. After leaving office, President Bill Clinton established the William J. Clinton Foundation and the Clinton Global Initiative with the mission to improve global health, strengthen economies, promote healthier childhoods, and protect the environment by fostering partnerships among governments, businesses, nongovernmental organizations (NGOs), and private citizens to turn good intentions into measurable results. Since 2001, President Clinton’s vision and leadership have resulted in more than 4 million people benefiting from lifesaving HIV/AIDS treatment; more than 14,000 U.S. schools building healthier learning environments; more than 26,000 micro-entrepreneurs, small business owners, and smallholder farmers improving their livelihoods and communities; and more than 2 million tons of greenhouse gases cut or abated in some of the world’s largest cities. Laureate International Universities is a trusted global leader in providing access to high quality, innovative institutions of higher education. The Laureate International Universities network includes more than 60 accredited campus-based and online universities. Our more than 675,000 students are part of an academic community that spans 29 countries throughout North America, Latin America, Europe, North Africa, Asia and the Middle East. Laureate universities offer hundreds of undergraduate, master’s and doctoral degree programs in fields including architecture, art, business, culinary arts, design, education, engineering, health sciences, hospitality management, information technology, law and medicine. President William J. Clinton, 42nd President of the United States, serves as The Honorary Chancellor of the Laureate International Universities network, offering advice on social responsibility, youth leadership and increasing access to higher education. For more information, visit www.laureate.net.